Heritage for Peace is delighted to welcome Hameed to the newsletter team. 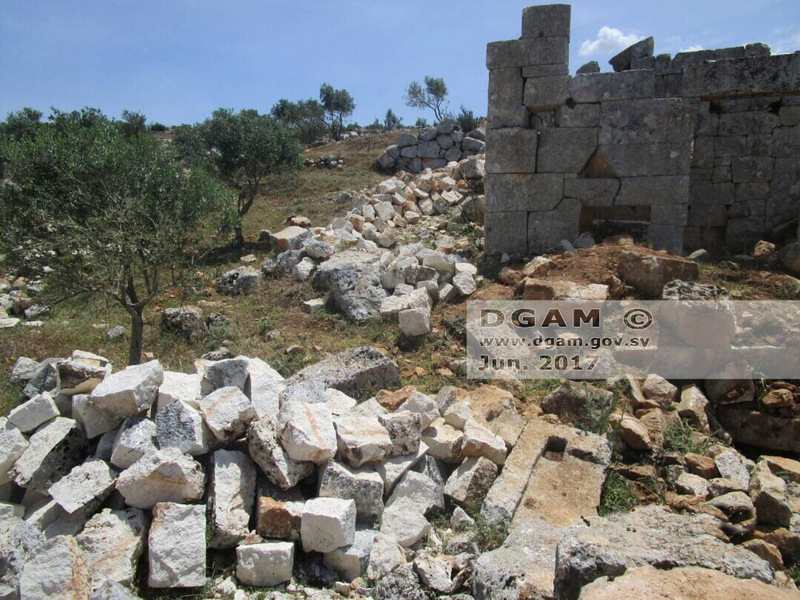 The DGAM received a collection of photos showing infringements in the ancient villages of Jabal al-Zawia in Idlib province: Bara, Maglia, Bashila, Bouda, Sergila, etc. Damage includes breaking the archaeological stones and selling them for use in modern construction, as well as encroachment on modern buildings on the campus of archaeological sites and illicit excavations. Read more here. The DGAMs World Heritage State of Conservation report on Syrian cultural heritage sites is now available online, ready for the World Heritage Committee meeting. Download the full report from the UNESCO website here (goes straight to the download option). Aleppo Archaeology has posted 3 photos that seem to show damage to Beit Kubbeh, here. Association for the Protection of Syrian Archaeology has posted photos of a fire caused by bombing at the historic Al-Omari mosque in Daraa, available here. The DGAM have recovered two more Palmyrene funerary tombstones in Homs, with the aid of the authorities, available here. Food markets in Darwin, Australia, allow Syrians to share their culinary heritage. Read more on the ABC News website here. Berlin-based chef Malakeh Jazmati publishes a German language cookbook to share Syria’s culinary traditions and heritage. Read more on the Deutsche Welle website here. City Beat writes about the importance of preserving Syria’s culinary traditions. Read more on the City Beat website here. Palmyra Coordination has posted a video of a refugee from Idlib drawing in sand, a tradition passed down from his grandparents which is both his hobby and profession “showing the world we don’t die after all the tragedies and hardships”, available here. The The Authority of Tourism and Protection of Monuments has issued a statement condemning the destruction at historic Sur Amad, part of the World Heritage Site, which they say is part of an attempt to change regional demographics. They are appealing to “UNESCO and all international institutions concerned with the protection of human heritage and heritage to stand up to the […] cultural genocide”. Read more here. The Violet Organization, a Syrian NGO, has launched a new project to rebuild damaged infrastructure in Idlib city. Read more on the Al-Monitor website here. The Syrian Heritage Archive links to a German TV program about inhabitants returning to Aleppo and the rebuilding process. Watch the video on Facebook here (German). The director of the National Museum in Prague announced that 1.5 million Euros will be used to repair damaged Syrian antiquities and monuments. Read more on the Victoria and Albert Museum website here. Open day with Young Researchers focusing on topics in cultural research that are relevant to the current Syrian context based on research papers conducted throughout the 4 previous editions of the annual programme Research: To Strengthen the Culture of Knowledge. Monday 5th of June 2017, from 2:00 till 6:00 p.m. Auditorium B – West Hall – AUB, Beirut. Read more on the Santa Fe New Mexican website here. The “Pakhuis de Zwijger in Amsterdam held a series of events that brought together Syrian and European researchers and city lovers in discussion about the future of the devastated city of Aleppo. Aleppo Project fellow AlHakam Shaar took part in the keynote panel and co-organized a workshop on identity, ownership and agency in defining and re-visiting cultural heritage.” Read more on the Aleppo Project website here. The Aleppo Project examines how to reconstruct Syria, highlighting the importance of “an interactive and inclusive approach that guarantees social justice and equality for all.” Read more on the Aleppo Project website here. Art Net publishes a new review of six prominent Syrian cultural heritage sites that have been damaged or destroyed. Read more on the Art Net website here. The Global Heritage Fund links to a Wall Street Journal video about the trafficking of artifacts from Syria. Watch the video on Facebook here. Irina Bokova, Director-General of UNESCO, reiterates the role of cultural diversity in peacebuilding. Read more on the United Nations website here. The Los Angeles Times describes damage in Palmyra, and remains hopeful. “Palmyra has emerged profoundly damaged but not obliterated.” Read the LA Times article here. A new subreddit, r/Lost_Architecture, shows images of architecture that no longer exists, including pictures from Palmyra. Read more on the Architecture and Design website here. Project Syndicate reports on the importance and scope of international efforts to provide higher education opportunities for Syrian refugees. “Losing this generation is a cost the world cannot afford.” Read more on the Project Syndicate website here. Syrian pianist Qais Al-Safadi is the youngest participant in the Russian Music Generations Festival. Read more on the SANA website here. Heritage Daily writes about the theological, historical and political reasons for the destruction of Syrian archaeological sites. Read more on the Heritage Daily website here. The Independent Review Journal talks about links between antiquity trafficking and funding of violence. Read more on the IRJ website here. An excavation from the Khabur River basin in Syria is leading to new discoveries about ancient urbanization. Read more on the Yale School of Forestry and Environmental Studies website here. A photography collection in California shows images from Frank Kidner, who documented the region around Aleppo during the 1990s. Read more on the Harvard News website here. The Economist examines the interactions between heritage destruction and art, with a special mention of responses to Syria. Read more on the Economist website here. In a new book by Khaldoun Fansa, “a long time resident of Aleppo takes a tour of the old quarter and provides historical sketches and photos.” Read more on the Cune Press Publishing website here. The History.com website writes about the new Endangered Archaeology in the Middle East and North Africa (EAMENA) database. Read more in the original article here. Syrian sculpture Nizar Ali Badr receives international recognition for his work on a children’s book aout Syria. Read more on the SANA website here. The BBC follows the story of Zahed Tajeddin, a resident of Aleppo who was recently able to return to his home. Read the full story on the BBC website here. Syrian artist Ghassa Akel draws on the “heritage of Syrian art and modernity.” Read more about his background and art on the Syria Times website here. Al-Monitor covers the challenges Syrians face in Ramadan. Read more on the Al-Monitor website here.